Des-man: a Desmos Labs Project. First, you had Fawn Nguyen’s assignment where students created a face using the Desmos graphing calculator. Students reviewed conics and domain and range. That was a blast for a lot of reasons. Now Desmos has created a system where the teacher can quickly see the creation of the faces in real-time and use filters to sort quickly through student work in productive ways. Des-man explores the potential of networked devices in math class. You could download the Desmos iOS app, flip off your iPad’s Internet connection, and still have a good time creating your Des-man. If the experience of using a digital math curriculum doesn’t get any better when you turn on the Internet, it is wasting the Internet. With Des-man, an Internet connection lets you see all your friends’ Des-men instantly, as they’re being drawn. It lets the teacher see the Des-men quickly too and then select and sequence them in productive ways. We have here a math activity for networked devices that doesn’t waste the network. That shouldn’t be noteworthy, but it is. 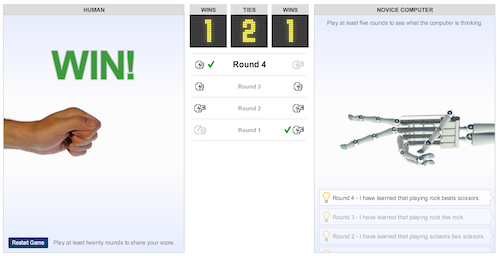 Anyway, the NY Times online Science section has shared an online game of “Rock, Paper, Scissors”, where you can play against a choice of computer opponents. The “Novice” opponent has no understanding of your previous moves or stratgey. But, the “Veteran” option has gathered data on over 200,00 moves, and will try to use its database to crush your spirit Here’s what we did. After this short conversation, I think I saw some light-bulbs come on. There was laughter, and I heard several girls discussing how they were going to ask the next guy they were interested in if he was a function or non-function. They decided this was problematic, though, because he wouldn’t know what they were talking about if he hadn’t taken Algebra 2. The boss has decided that teachers are going to wear a number around their necks. No, we are not all convicts doing time. It’s a cunning plan to get the kids to look at numbers in new ways. The whole idea is that the students are not allowed to use the names of the teachers. They need to call them by a number combination or calculation that equals their number. We decided that if we wanted kids to talk, they needed to have something rich and complex to talk about and make sense of. After brainstorming some different options, we turned the computational question into a conceptual one. 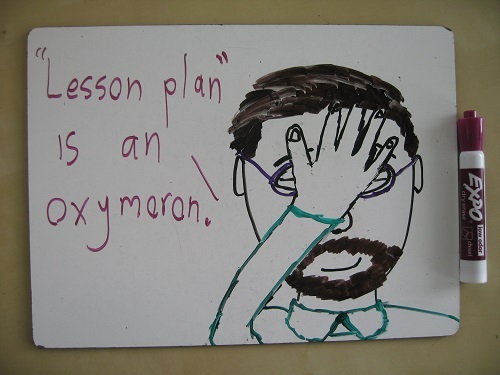 Oakland math teacher Ben Orlin started tweeting in April and blogging around the same time at his site, “Math with Bad Drawings,” which he illustrates with bad drawings (his description!) like this. He’s got great instincts for teaching, great insights into student thinking, and a punchy, nimble style. I highly recommend you subscribe to his blog, follow him on Twitter, stalk him at work, etc. Many thanks to Mr. Weiss for reminding me to compile all of this summer’s makeovers. Here’s every revision principle we applied this summer, ranked from most frequently occurring to least. (6) Raise the ceiling on the task. (5) Lower the floor on the task. (4) Reduce the literacy demand. (2) Put students in the shoes of the person who might actually experience this problem. (2) Start the problem with a concise, concrete question. (2) Ask a better question. (1) Offer an incentive for more practice. (1) Get a better image. (1) Open the problem up to more than one possible generalization. If you’re looking for a dy/dan house style, for better or worse, that’s it right there. 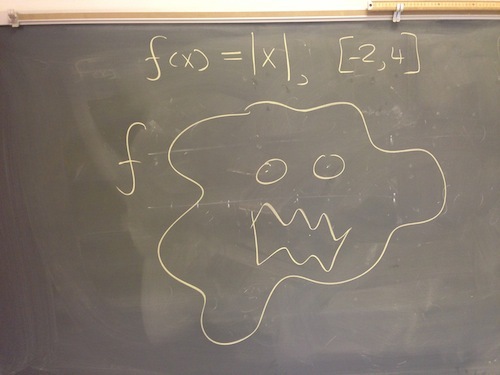 f(x) is a function monster, and it can only *eat* numbers between -2 and 4. Now we define g(x) = f(x-3). We know that f eats numbers from -2 to 4. What numbers can g eat? I love how this scenario never fails me. Inevitably when I ask – not for the final answer – but the process and thinking that students used to find the answer, someone shares that they thought of “outfits” … 3(20 + 25) … and someone else shares that they thought of shirts and jeans separately … 3 • 20 + 3 • 25. That question opens up a lot of potential thought-trails to wander down. As I did this activity with students today, the class settled on three criteria for rating these reflection attempts. The first is that the image and pre-image should be congruent. The next thought was that the image and pre-image should be the same distance away from the line of reflection. Finally, the students thought that the segment connecting the image/pre-image pairs would should be just about perpendicular to the line of reflection.